"You do not have the right to try this case!" 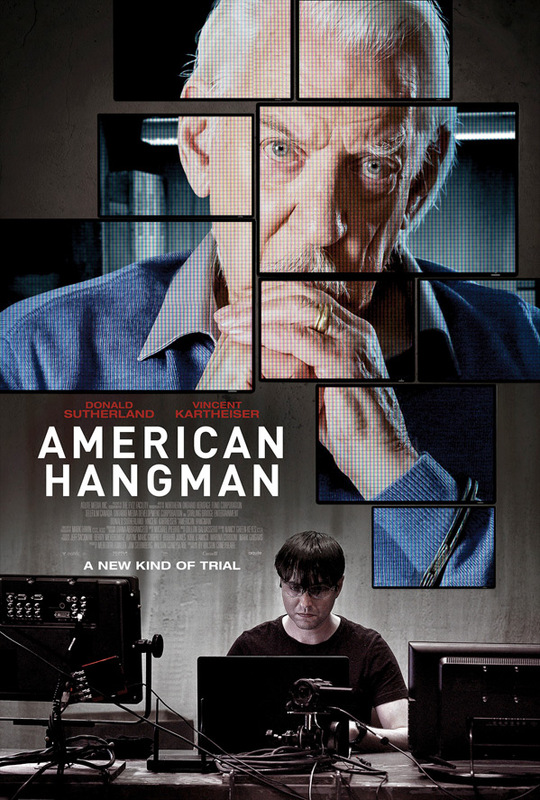 Aqute Media & Vertical Entertainment have unveiled the first trailer for a psychological thriller titled American Hangman, another play on the web being the perfect place to take advantage of viewers who want to watch something too real. The film is a thriller built around a "relentlessly ticking clock and a rapidly approaching deadline and verdict." A kidnapping, broadcast live online, turns into the trial of a judge who presided over a botched criminal case. This time, however, the audience gets to play judge and jury, deciding if the judge himself gets to live or die. Donald Sutherland stars, with Vincent Kartheiser, Oliver Dennis, and Paul Braunstein. Looks compelling & frightening. An unidentified man posts a live feed on social media showing that he has kidnapped two strangers and intends to kill one before the day is out. His intention is to hold a capital "trial" online. As the authorities recognize what's happening, it becomes apparent that the online public is going to act as judge and jury. American Hangman is both written and directed by writer / filmmaker Wilson Coneybeare, making his second feature film after directing A Ted Named Gooby before, and creating the TV series "Timeblazers", "Monster Warriors", and "Majority Rules" previously. Aqute Media & Vertical Ent. will release Coneybeare's American Hangman in select theaters + on VOD starting January 4th, 2019 at the beginning of next year.